OpenROV is an underwater robot controlled through a web browser. The server-side of the web app is written in Node.js, running on a BeagleBone Black inside the OpenROV. You don’t need to know Node.js in order to pilot an OpenROV. And you don’t need to do anything in this article to construct an OpenROV from a kit. But if you’re the kind of maker who likes to dig deep into a project, you might enjoy exploring Node.js. Everything written here applies to Node.js as it runs on Mac OS X. If your local machine runs Linux or Windows, you will need to consult other resources in order to run Node locally. 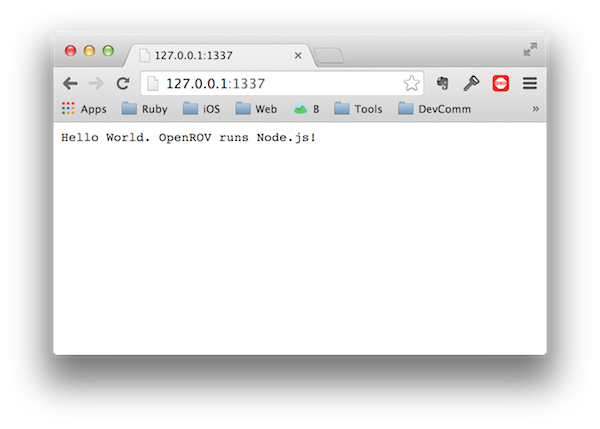 Now that Homebrew is installed and running, Node.js can be installed with a single line command. You know the compter science tradition: The first program in any new language has to say “Hello World.” Here’s a sample Hello World program from the official Node.js web site, slightly modified to suit OpenROV. First, create a file called helloworld.js and fill it with the following code. // Sample web server from http://nodejs.org, slightly modified. Finally, open up a web browser on your local machine and navigate to http://127.0.0.1:1337. You should see a bare-bones web page similar to this one. Now that you have Node.js running locally, you’re ready to explore the OpenROV repo on GitHub. What does Node.js do for OpenROV that other languages can’t do? What other languages might we use to control OpenROV? It’s all open source, so our brainstorms could one day turn into actual code running on OpenROV! How does Node.js on the BeagleBone Black interact with the Arduino and other OpenROV components?